Joan Meakin was born in Newington, Connecticut on April 20, 1951. Her interest in art developed as a young child, influenced heavily by both her mother and her sister. She graduated from the University of Connecticut, but was never enrolled in any art courses. She continued to pursue her love for creating outside of her education. In the 1970’s, her and her late husband bought a plot of land deep in the woods of the Moosehead Lake area in Maine. They built a house from scratch with no electricity, grew their own food, and raised two children in the time they spent there. In this experience of surviving solely on the resources around her, her connection to nature grew stronger. More recently, over the past 30 years, she has worked for numerous professional companies specializing in costume design and construction, including: The Hartford Stage Co., The Connecticut and The Connecticut Grand Opera Co, The Hartford Ballet, Pilobolis, and Jacob’s Pillow. She has toured with the Moscow, Bolshoi and Stanislavsky Ballet.“Working with dancers has influenced my awareness of the movement I find in the wood I use for my creations. Any alteration of the root or branch is minimal, as nature has already created their beauty.” (Joan Meakin). Combining both her deep love for nature and passion for dance, she creates sculptures using found wood and polymer clay. Using the polymer clay as filler only, she enhances the human forms already present. The clay needs a low heat to harden, thereby not harming the integrity of the wood. The sculptures also cause minimal damage to the environment in their making, because they are made from natural, found materials. 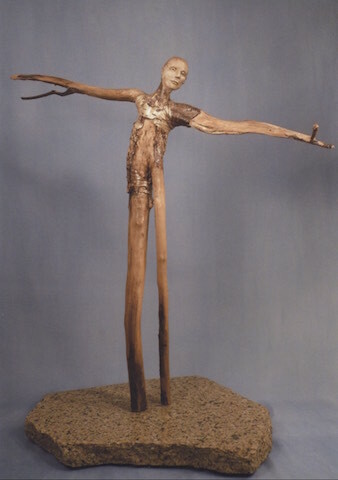 Her sculptures have been on display in the Spencertown Academy Arts Center and the Berkshire Museum in Massachusettes, as well as being published in the book Woodland Style by Marlene Hurley Marshell.